The 2011 SRA Code of Conduct places much greater emphasis on how you manage risk within your practice. This is particularly important for the new roles of Compliance Officer Legal Practice (COLP) and Compliance Officer Finance and Administration (COFA). We can assist you in identifying, assessing and minimising risk within your business and putting in place measures to deal with this and comply with your regulatory responsibilities. 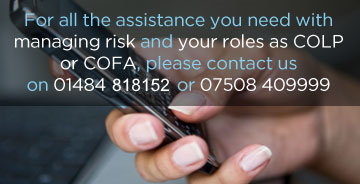 If you require some assistance with preparing documentation and procedures to manage your COLP and COFA responsibilities, then please contact us for details of our cost effective service.